Is there any better feeling than waking up and unzipping your tent to a truly breathtaking view and basking in the early morning light? There’s something so peaceful about waking up to the breeze flowing through your tent and the sound of gentle birdsong. Breakfast is alfresco and for some reason, always tastes better when you’ve cooked it on a stove or campfire. 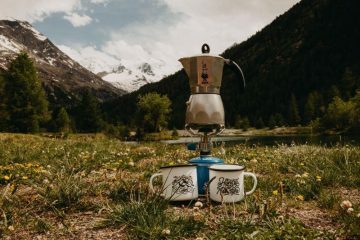 Camping disconnects you from the busy hustle and bustle of everyday life and gives you the opportunity to truly kick back, relax and enjoy what nature has to offer. 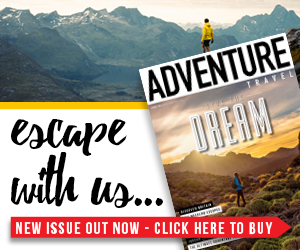 So with that in mind, we teamed up with outdoor equipment brand Vaude to provide you with some inspiration. As a brand, Vaude knows a lot about making the most out of the outdoors having been providing a diverse range of high quality and lightweight tents to outdoor enthusiasts for over 25 years. 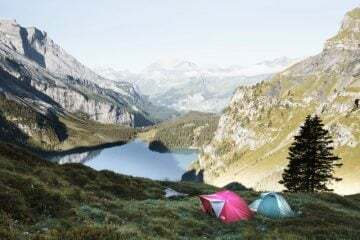 Together, we came up with a list of seven of the best camping sites in the UK to help provide some inspiration for your next summer camping trip. Set within the stunning Looe Bay in Cornwall, this coastal campsite boasts exceptional panoramic views of the sea. The site is surrounded by beautiful coastal walking paths, stunning beaches, quaint fishing villages and cafés. Spend the day filling your lungs with fresh sea air (and filling your stomach with cream tea) and fall asleep to the soothing sound of waves lapping gently against the shore. If you fancy making some new friends while you’re there, pop over and say hello to the site’s seven Shire horses: Sadie, Sophia, Sky, Leo, Jimmy, Jack and Buster! 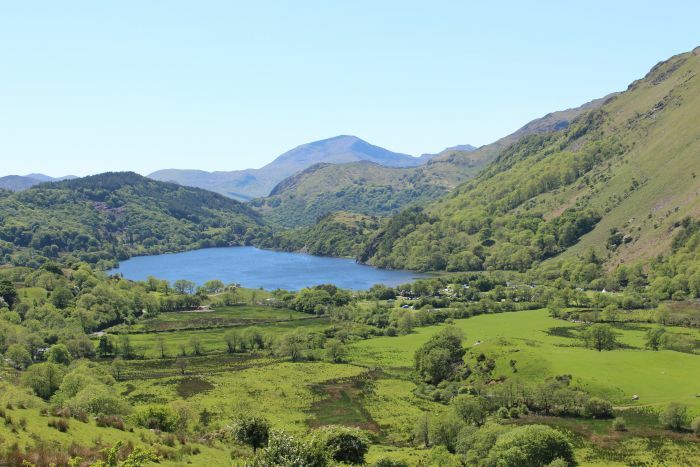 This one is ideal if you want to explore the breathtaking trails of Snowdonia National Park and is the perfect base if you wish to hike Mt Snowdon, as you can walk directly from the site. The campsite itself is situated in one of the most gorgeous valleys in Wales and is set beside a stunning lake – so pull up a camp chair, grab a beer and watch the beautiful wildlife that thrives around it. 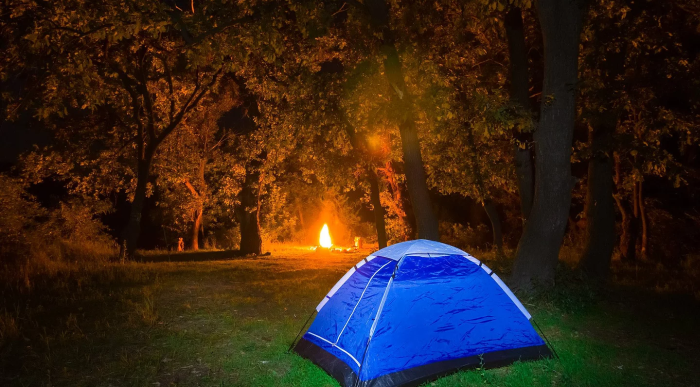 The site allows for you to have your own campfire in one of their steel fire pits, so make sure you don’t forget to bring a bag of marshmallows. Oh, and they also have a stone bake pizza oven pumping out delicious meals throughout the evening in the summer… need I say more!? The Peak District is renowned for its stunning landscapes and spectacular hiking routes. Fieldhead Campsite is set within Edale, a picturesque village ideally situated at the start of the Pennine Way, which makes this site the perfect base camp for those who wish to start the first section of the 256-mile hiking trail. Being at the foot of Kinder Scout, the site also offers plenty of other hiking, biking and climbing opportunities. 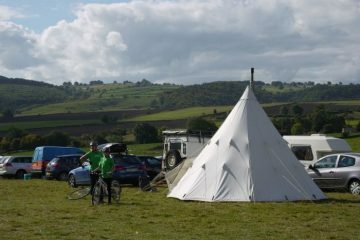 The campsite is spread over six fields, each specifically tailored to family, riverside, backpacking or no vehicle pitches, which makes it easy to pick and choose the perfect camping spot for your trip. 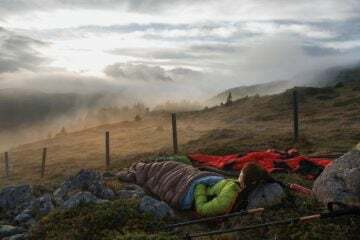 So, this is one for the more adventurous folk, but honestly, if you think you could survive for a couple of nights without showers or luxuries then you should definitely give wild camping a go. Forget noisy neighbours and other people’s tents spoiling your view – wild camping rewards you with true tranquillity and seriously epic views. Unfortunately, it’s illegal to wild camp in most places in the UK. 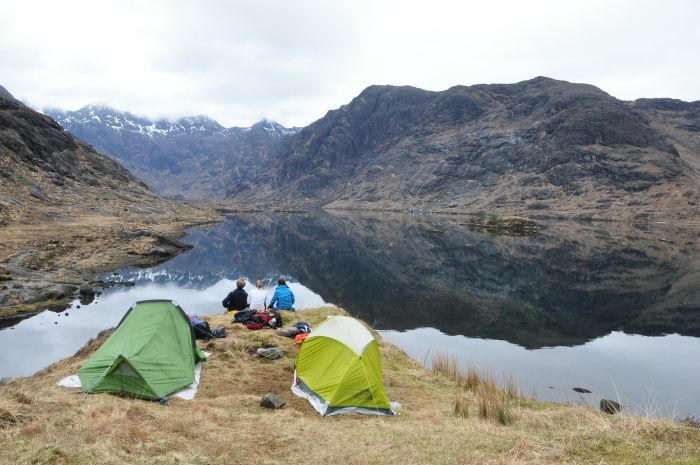 However, Scotland is one of the few exceptions as long as you adhere to the ‘leave no trace’ rules and don’t pitch your tent on farmland or private property. 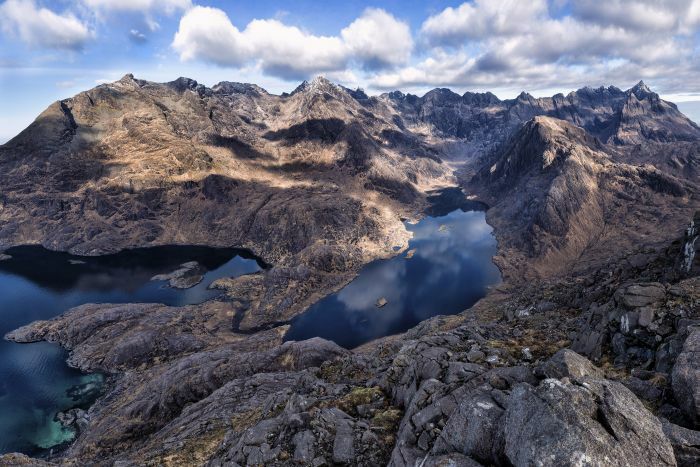 The Isle of Skye offers wild campers some of the most breathtaking and awe-inspiring scenery that Scotland has to offer and is famous for its incredible wilderness areas – ideal for finding a perfect camping spot! If you fancy stripping things back down to basics, but you aren’t quite up for wild camping, then Fox Wood could just be a cracking compromise. Set within a magical wooded valley, no cars are allowed on site, so visitors must park in the entrance car park, (and here’s the fun bit) transporting their camping equipment by trusty wheelbarrow! Once you’ve settled, you’ll start to notice how beautifully peaceful this campsite is. The site’s humble facilities include gas-powered showers and composting toilets, however experiencing the woodland way of life and chilling next to your personal firepit within your own private natural clearing makes for one incredibly tranquil camping trip. 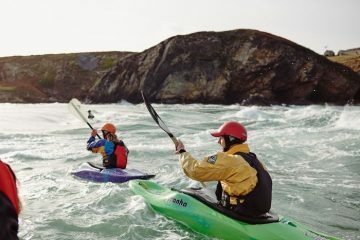 This National Trust campsite offers a whole range of different camping pitches to suit the tastes of every camper. There are glorious waterside spots with views of the stunning lake, gorgeous woodlands and stunning meadows buzzing with fascinating wildlife, so you’re sure to find the perfect spot for you. The location itself is breathtaking, and as you would expect, being in the heart of the Lake District, has some enticing walking and hiking opportunities, adventure activities, and attractions on its doorstep. A lot of Dartmoor National Park is covered by the Dartmoor Commons Act, which means you are allowed to wild camp in some areas. So, if you fancy giving wild camping a go, but don’t fancy the Scottish Highlands, then Dartmoor is a fantastic place for you to give it a try. It’s a magical place, and the further off the path you go, the better. The last time I wild camped in Dartmoor, I set my tent up beside a lovely little stream, and wasn’t bothered by a single soul the whole time I was there – absolute bliss! Please be aware that before setting off, you’ll need to check where the military training areas are, as sometimes they use them as firing ranges and believe me; you don’t want to get caught up that! You can find all the information and maps online and as long as you avoid those areas, you’ll be safe and sound. 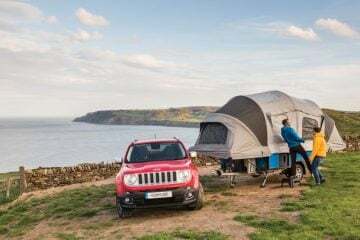 Whether you plan to pitch up at a cosy campsite or find that perfect off-the-beaten-track spot on your next camping adventure, you’ll need kit that can keep up. Vaude is an environmentally -friendly company which has a fantastic range of tents and camping equipment, perfect for helping you to stay comfortable while you enjoy nature to the fullest. New for spring/summer this year, Vaude has announced the launch the Terra range of tents. These tents benefit from super lightweight materials and design, making them ideal for backpacking adventures. The Terratrio 2p is a lightweight, two-man tent boasting an offset dome design, which makes for better headroom and the colour coded poles make pitching a dream. You won’t find that three’s a crowd with the Terraquattro 3p, this tough yet lightweight, three-man tent provides a spacious environment, set with a porch at both ends – perfect for cooking and storage.